The New Fairfield Flash Track team is open to boys and girls, 5th grade through 8th grade from New Fairfield and Sherman. The New Fairfield Flash competes against teams from Fairfield County. Bus transportation is provided to most of the meets. Our girls team is the defending league and state champions! Taking over as head coach will be Pete Pomeroy, he will be assisted by Jim Ogden, Janet Simons and Jim Keller. The cost is $145, a season t-shirt is included in the cost of registration. All new members will need a uniform. There are sweatshirts, hoodies, socks and jackets available to be ordered. You can mail in the registration to the address on the form. Practices will be held Monday/Wednesday/Friday from 6:30 to 8 PM and Saturday 9 AM to 11 AM at the high school track. Practice will start the week of March 25th and the season goes through to early June. 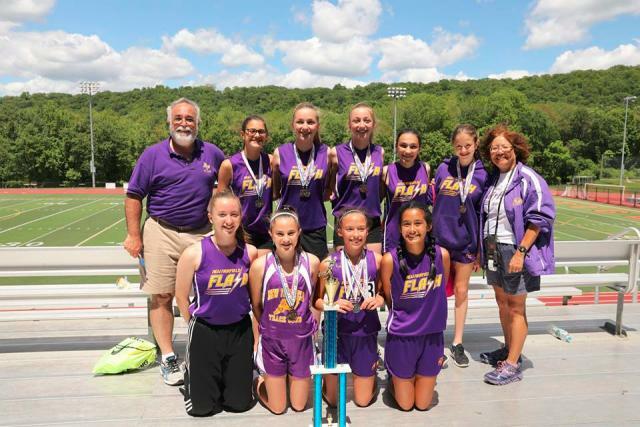 Established in 2001, the New Fairfield Flash Track Club has sponsored Cross Country and Spring Track and Field teams for middle school aged athletes from New Fairfield and Sherman. 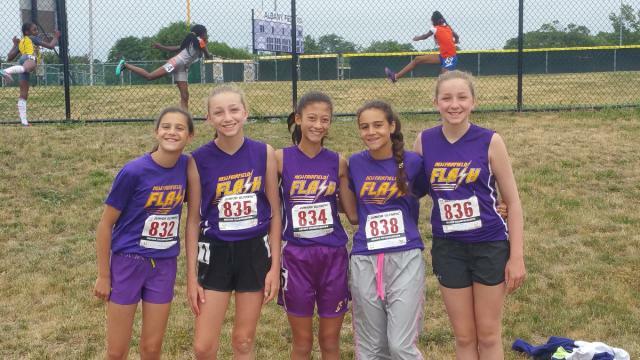 This year the New Fairfield Flash will be sponsoring the Western Connecticut Flash for the ‘off-seasons’ of winter track and summer track. The WC Flash will be open to any athletes from New Fairfield, Sherman and the surrounding towns. 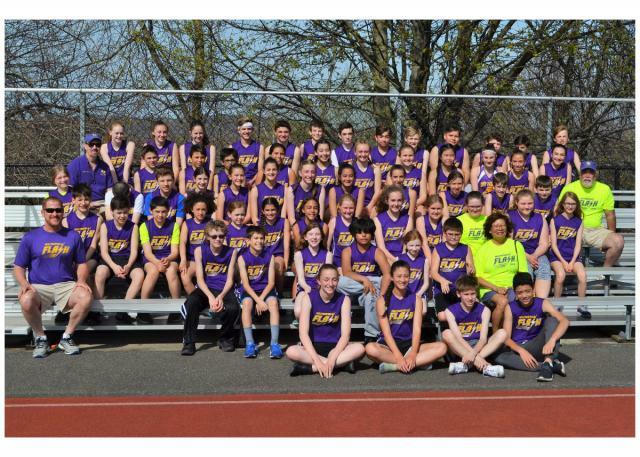 Coaches Jim Keller and Shawn Sorbello are both highly experienced youth and high school track coaches and will be leading the new club in its inaugural season. They will continue the Flash philosophy of allowing athletes to select the events they want to do while steering athletes in the direction of where their abilities may lie. WHO: Boys and girls, 3rd to 8th grade. EVENTS: 55 meters to 3000 meter races. Relays, hurdles, long jump, high jump, triple jump and shot put. Competition is age-based. (i.e. 7/8, 9/10, 11/12, 13/14). MEETS: Most meets will take place at Hillhouse High School, New Haven, CT. COST: $170 for the season which includes a team shirt. Additional costs as needed will be USA Track & Field membership ($20), meet entry fees and optional additional team apparel. Another meet may be added in October. Home meet. Report to track right after school. The fall cross country season starts Thursday, August 30th. Practices are Monday/Wednesday/Thursday, 5:00 to 6:15PM. Registration is still open. You can bring your registration form to practice. Join the New Fairfield Flash Track Cross Country Team. Practices will be Monday/Wednesday/Thursday, 5-6:15PM. Practice starts August 30th. Get in shape for the fall! Boys and Girls, all ages. Get in shape and build up your endurance for the upcoming season. When: Tuesdays and Thursdays, Aug 2nd through Aug 28th at 6 PM. Where: 38 Rita Drive, NF. Jim Keller, NFHS cross country and track coach will conduct the training. What: You will run the neighborhood roads with adult supervision, building up your endurance each week with longer runs. Afterward you can swim in Coach Keller’s pool. The cost is $20 for the entire program or $5 per day. Parents are free with a child. If you join the NF Flash cross country team in the fall you will receive a credit for the amount paid. Thank You To The Awesome Businesses That Donated To Our Raffle!